No office hours on Monday next week. I scheduled time next week on Friday (April 20th) from 1pm–3pm in Giannini 254. Next week we will wrap up spatial data. We have some flexibility for what we cover the next two weeks: strategies for large datasets (big data), efficient coding practices, machine learning, web scraping, a paper replication—any other ideas? What are your preferences? In the previous section we covered instrumental variables (IV) and two-stage least squares (2SLS)—two tools an econometrician can use against the bias/inconsistency generated by omitted variables, measurement error, and simultaneous equations. In case you would like a few examples of papers that apply instrumental variables. Below are several options. In general, it is hard to go wrong with Angrist and Krueger (or Imbens). The first two papers are actually a summary articles—the first paper has a great table of instrumental variables papers in myriad settings. The third paper (Angrist, 1990) is a classic. The fourth paper is fairly new by Reed Walker (Berkeley). The fifth paper (Lee et al.) is a working paper on rural electrification by three more Berkeley folks. The last paper (Maccini and Yang, 2009) is a pretty classic paper of health, development, and measurement error. I’ve provided the PDF of the first two papers. You’ll need to download the other papers from an IP address with access. More generally, over the summer, you should read the book Mostly Harmless Econometrics by Angrist and Pischke. Adding the instrument to your regression without doing 2SLS (or IV) does not fix your problem—and may make it worse. To see why, think about Frisch-Waugh-Lovell.1 If we residualize all variables on the (exogenous) instrument, then the remaining variation (in the residuals) is still endogenous. Worse yet, we’ve already controlled for the exogenous variation, so this strategy will estimate the coefficient using only the endogenous variation—essentially the opposite of what IV/2SLS does. This week we move a bit away from econometric techniques and instead focus on a class of data: spatial data. Spatial data are increasingly important to economic—and general social science—research. They also provide researchers with a few unique challenges and thus require a few unique tools. Note: With all of these packages floating around, it is quite likely there will be overlap in some of the names of the functions. Recall that R will mask a previously loaded function if you load a new package that has a function with the same name. For instance, the packages magrittr and raster both have functions named extract(). Keep this fact in mind if you run into problems while you have many functions loaded. Remember that you can always force R to use a specific package’s function using package_name::function_name(arg1, arg2, ...). 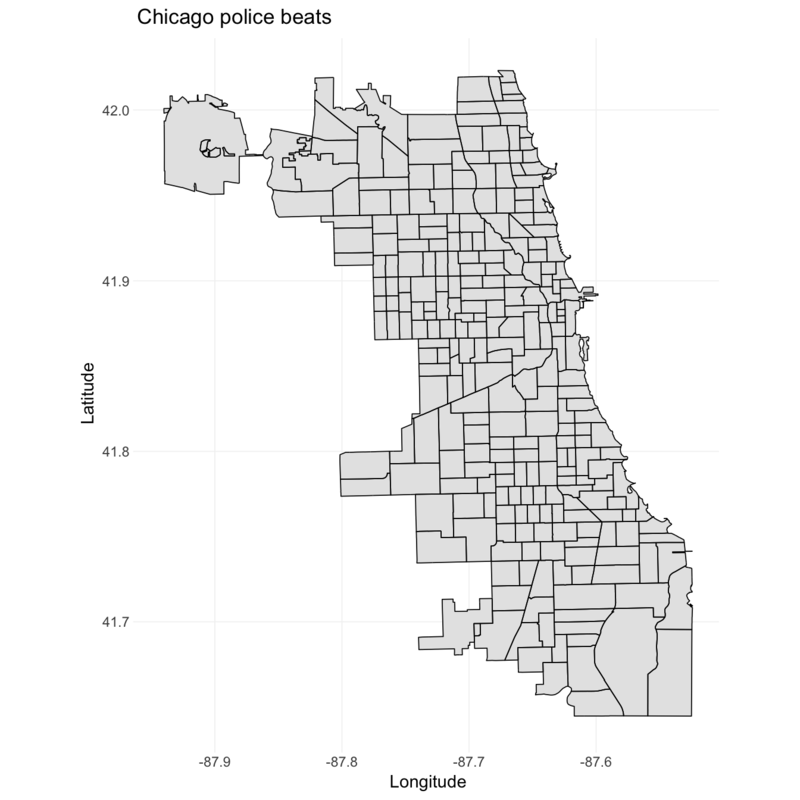 The folder ChicagoPoliceBeats, which contains the shapefile of Chicago’s police beats. As I mentioned above, today we are focusing on a class of data, rather than a specific set of econometric techniques. The reason for this change is manyfold. Spatial data are increasingly important within research—economics, environmental studies, development, agriculture, political science all are increasingly utilizing spatial variation. Spatial variation is important in many data-generating processes (e.g., the effects of air pollution), and it also can provide some compelling natural experiments (e.g., the rollout of a new policy throughout a country). Furthermore, some topics simply cannot be analyzed well without analyzing the topic in space, e.g., air pollution, gerrymandering, segregation, or well depletion. Spatial data are fairly distinct from other types of data in their structure. These structural differences tend to require unique techniques for compiling, describing, and analyzing the data. Why the difference? Spatial data have more dimensions than most other datasets that we use. Rather than a value connected to a time, we usually have a value connected to a latitude and a longitude–perhaps coupled with time and/or elevation. This difference is not huge; it just requires a little more machinery. Following the theme of section this semester, I am going to show you how to get started with spatial data in R. Of course, there are other tools. ArcGIS is probably the most well-known name in GIS (geographic information systems), but it is proprietary, expensive, and only works with Windows. If you really need it, there are several labs on campus that provide access—see the D-Lab. QGIS provides a free, open-source, cross-platform alternative to ArcGIS. We’ll stick with R today; it’s free, it’s open source, and you are fairly familiar with it. Plus there’s a nice online community of people using R for GIS, so you can (usually/eventually) find solutions when things go wrong. Finally, because you will likely use R for the econometrics in your research, using are for your GIS allows you to minimize the number of programs/scripts required during the course of your analysis. Now that I’ve (hopefully) convinced you, let’s get started. There are two basic types of spatial: vector and raster. Vector data include points, lines, and polygons—the things generally contained in files called shapefiles. Raster data are comprised of single raster layers and raster stacks (stacks of raster layers) and are essentially images—values mapped to a grid. You will generally encounter vector data as shapefiles (extension .shp). However, you will also encounter vectors as datasets of points that include the coordinates of observations and some information about those points (often .csv). At their core, all vector files are simply collections of points. For points-based files, this statement is obvious. Lines and polygons are collections of points, so again, we see that the classes of objects that make up vectors are “simply” collections of points. 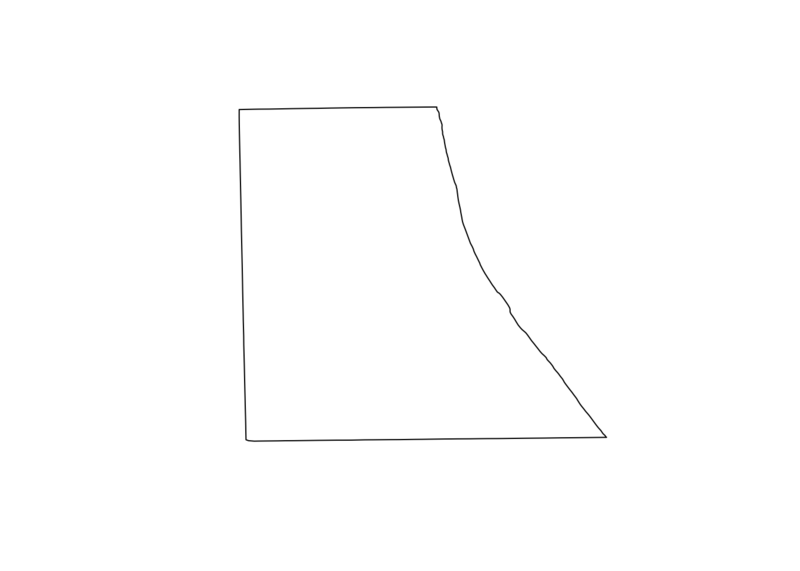 Let’s load a shapefile. 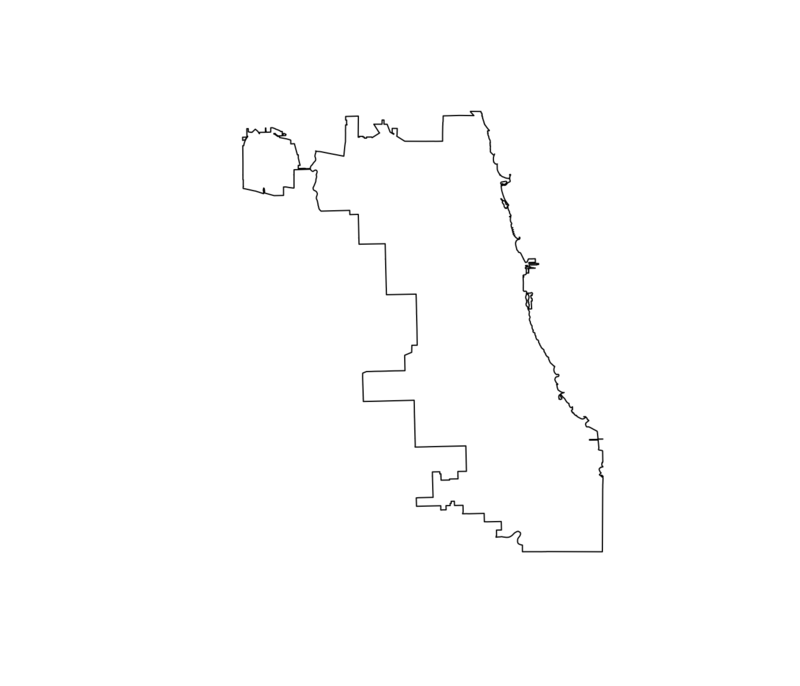 Specifically, we will load the polygons that compose the police beats for the city of Chicago.3 To read in the shapefile that comprises these spatial data, we will use the readOGR() function from the package rgdal. The function needs two arguments: dsn, which is generally the folder that contains the shapefile, and layer, which is generally the name of the shapefile (omitting the .shp extension). 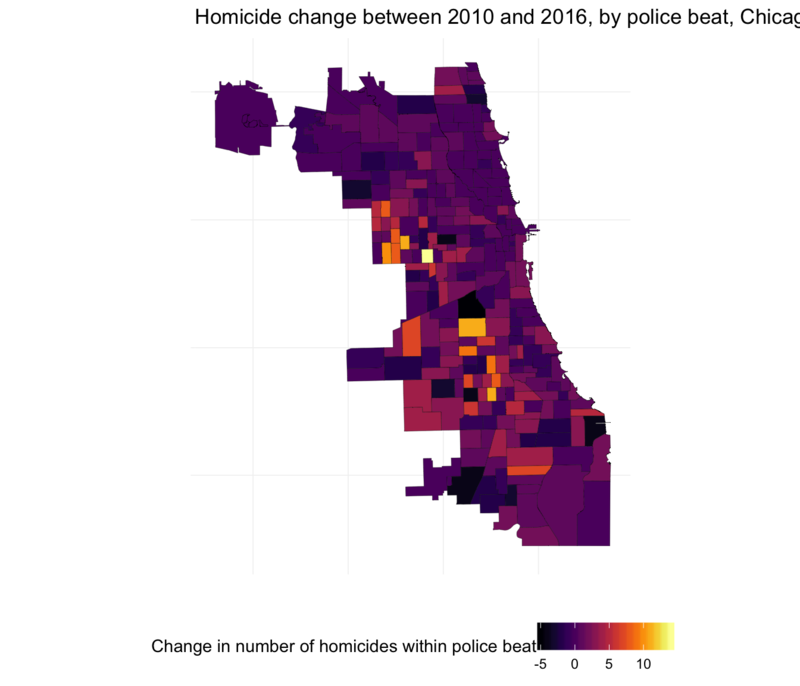 In our case, the name of the folder is “ChicagoPoliceBeats”, and the name of the shapefile is “chiBeats.shp”. Let’s load the shapefile! 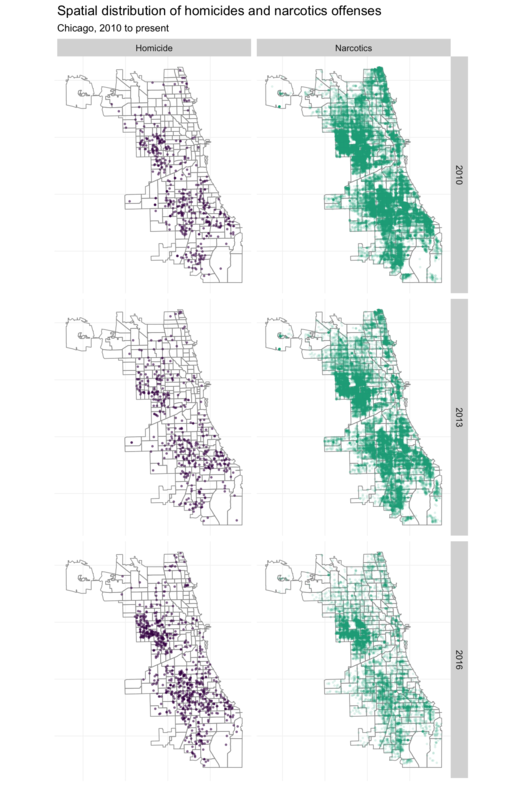 ## Source: "/Users/edwardarubin/Dropbox/Teaching/ARE212/Section12/ChicagoPoliceBeats", layer: "chiBeats"
Now, let’s check a few things—the class of the object we just read into R, its dimensions, and plotting it. Cool, right? So what does it mean that this “spatial polygons data frame” has dimensions 277 and 4? The first number is generally the number of distinct shapes (features) in the shapefile. In our case, we 277 polygons. And what about the second number? The second number gives us the number of fields—essentially the number of variables (a.k.a. features) for which we have information for each polygon. ##  "district" "beat_num" "sector"   "beat"
##  "data"        "polygons"    "plotOrder"   "bbox"        "proj4string"
The data slot is a data frame like we’ve seen before, but now there are other slots related to our spatial data: the polygons, the plot order (plotOrder), the bounding box (bbox), and the proj4string (a string that encodes the projection used for the polygons’ coordinates). Let’s see what objects are in the other slots. Finally, let’s investigate the polygons slot. What is the class? A list of length 277! Where have we seen the number 277 before? The dimensions of the beats_shp and the number of rows in the data frame in the data slot. The polygons slot is a list whose elements are the individual polygons that make up the shapefile. 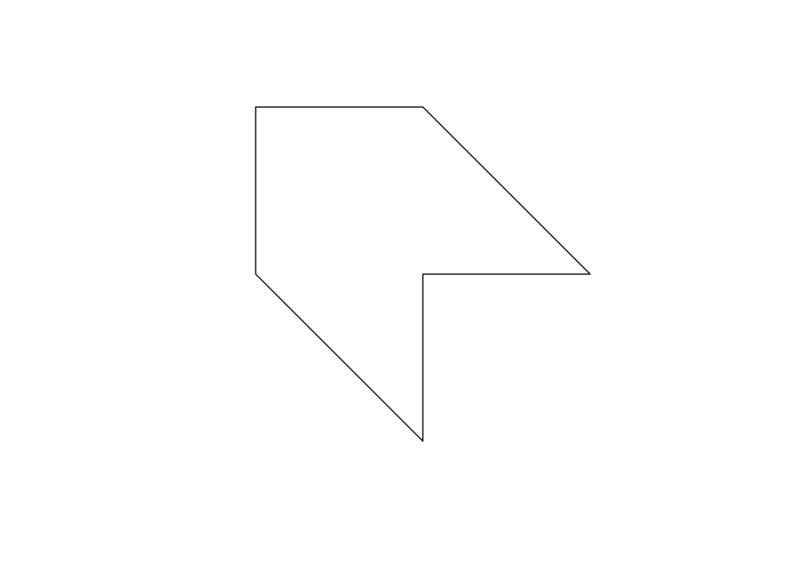 This polygon object has the class Polygons, which is simultaneously fitting and uninformative. Are you ready to get a bit meta? The polygons in the polygons slot have slots of their own. Let’s see the names of the slots for a single polygon in the polygons slot. ##  "Polygons"  "plotOrder" "labpt"     "ID"        "area"
Let’s (quickly) continue down this rabbit hole, accessing the Polygons slot and checking its class. # What is the class? # What is the length? Another list, but this list is only of length one. Let’s access the single element in this list and then check the slot names on last time. ##  "labpt"   "area"    "hole"    "ringDir" "coords"
Finally, we see a slot name coords. These are the coordinates of the points that make up the first polygon in our shapefile. Let’s check the head and dimensions of this object then plot its points. So what have we learned, thus far, about this shapefile? The shapefile is made up of polygons, and each polygon is made up of points on a coordinate system—in this case, longitudes (\(x\)) and latitudes (\(y\)). When you plot the points using their coordinates and then connect the dots (points), you get a polygon. Together, the polygons determine the shapefile. In addition to shapes of the polygons, we also have data (in the data slot) about each polygons. In the current example, we have four fields/attributes/features/variables6 about the polygons, but in other cases, you will know a lot more about each polygon—for instance, Census will have hundreds of variables for each polygon (the polygons are the Census blocks, tracts, etc.). Create a data frame with two columns for the coordinates. Convert the data frame to a matrix. Convert the matrix of coordinates to a polygon using Polygon(). Create a Polygons object using a list and the function Polygons(). Create a SpatialPolygons object from a list the Polygons object(s). Create a SpatialPolygonsDataFrame from the SpatialPolygons object and a data frame. Notice that we created the polygon by plotting the points in the order that they are listed (and connecting the last point to the first point).  In this example, we created only one polygon, but the process is similar for multiple polygons. You’ve already seen that we can use R’s base plot() function to plot shapefiles, but what if we want to use ggplot2? In this situation, ggplot2 still produces pretty pictures, but it can be much slower than plot() when you have a lot of polygons with many points. Plot at your own risk.7 This setting QGIS can be really helpful. Okay, so let’s plot the police beats shapefile. ggplot2 wants a data frame where each row is a point. As we saw above, we’re almost there—the polygons are composed of points—but we need to formally convert the spatial polygons data frame to a data frame. For this task, I suggest the tidy() function from the broom package.8 We simply feed our shapefile (the spatial polygons data frame beats_shp) to tidy(), and we get back a data frame where each row is a point in one of the polygons in the shapefile. This process can take a while and can also take up a lot of memory if you have many polygons with many points. Note: Plotting in ggplot2 is another point where the sf package is terrific—you can just use geom_sf() without the tidy()-ing. In addition to shapefiles, the second type of vector data you will often encounter is point data. These files are exactly what they sound like: each observation (row) contains coordinates for a point in space and information on some set of variables. Let’s load a points dataset. The file chicagoCrime.rds contains Chicago’s police incident reports data from 2010 through the end of 2016 (again, downloaded from Chicago’s data portal). The actual dataset has a few more variables and goes back to 2001, but I wanted to keep the file a bit smaller. I’ve saved the file as an .rds file, which is an R-specific format that offers a lot of compression, substantially reducing the size of the file. To load an .rds file, you can use the readRDS() function (or readr’s read_rds() function, which is just a wrapper for readRDS()). Let’s load it. Let’s clean up the file a bit more. First, we will change the names of the variables. Second, we will drop any observations missing their latitude or longitude.10 Third, we will convert the dates from character to actual dates using the function mdy_hms() from the lubridate package. The mdy part of the function’s name implies that the dates have month first, followed by day, follwed by year. The hms part of the function’s name implies that we have hours, minutes, and seconds. If you did not have hours, minutes, and seconds, then you would want to use the function mdy(). If you had year, followed by month, followed by day, then you would want to use the function ymd(). And so on…. Great! While we know that these data depict a points in space, R does not. However, we can easily tell R which variables are the coordinates for these data. For this task, we use the coordinates() function from the sp package (loaded when we load rgdal). You define the coordinates in a data frame using a slightly strange formula of the form coordinates(your_df) <- ~ x_var + y_var. Let’s do it. ##  "data"        "coords.nrs"  "coords"      "bbox"        "proj4string"
When we converted the data frame to a spatial points data frame—by assigning the coordinates—what happened to the coordinate reference system (CRS)? Did R find/choose a CRS for us? Nope. The coordinate reference system is missing. 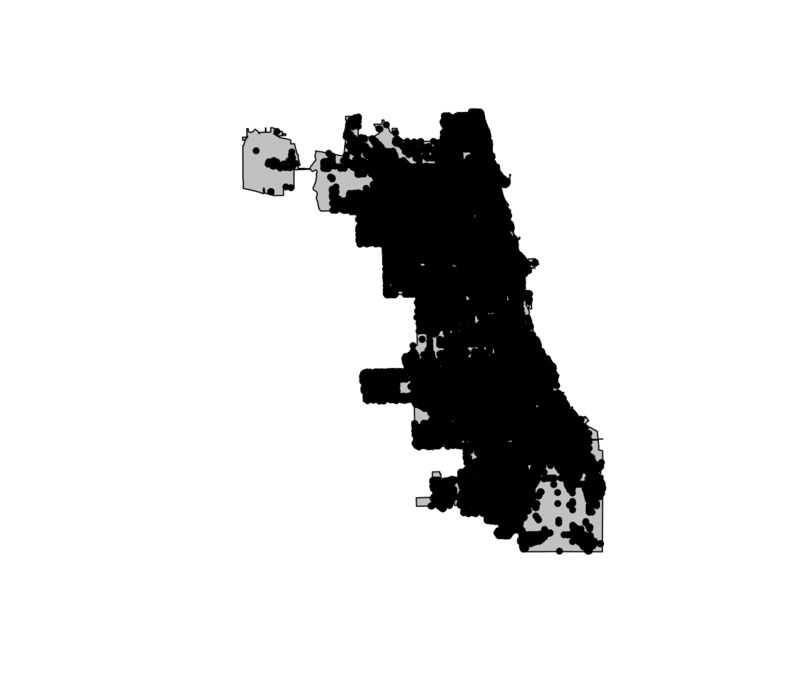 I could not find any information on the CRS that the city of Chicago uses, but let’s assume it matches their other data files—specifically the police beats shapefile we already loaded. We can assign the proj4string using a function by the same name. And we can grab the CRS from another object using the crs() function from the raster package. Let’s now add the points to our map. Because we have 2.2 million observations, we will focus on two primary offenses: narcotics (200,000+ observations) and homicide (about 3,600 observations). dplyr’s handy functions do not currently work on spatial points data frames, but we can use the old-fashioned subset() function, which is like a combination of filter() and select(). Let’s overwrite our current crime_df with the subset that includes only homicides and narcotics. 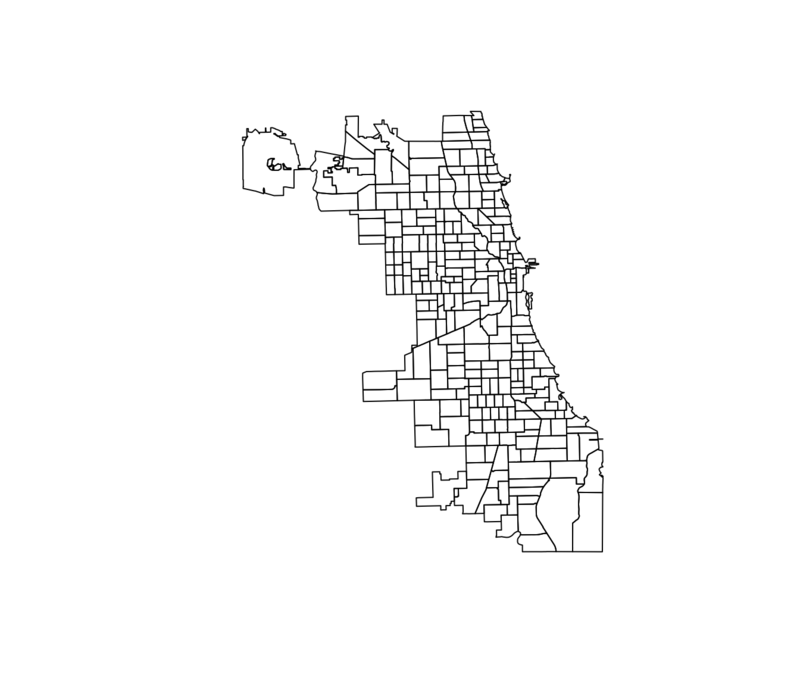 As with the shapefile data, you can quickly plot a spatial points data frame using the base plot() function. Let’s do it. It looks like we have at least one observation that is not quite in Chicago. From the police beats, we know where Chicago is, so let’s use this knowledge to drop observations that are outside of Chicago. This observation brings up an important point: with all of the data manipulation required for spatial data—or any data-intensive project—it is good to continually check the quality of your data to make sure everything is making sense. For spatial data, this often looks like making many maps. 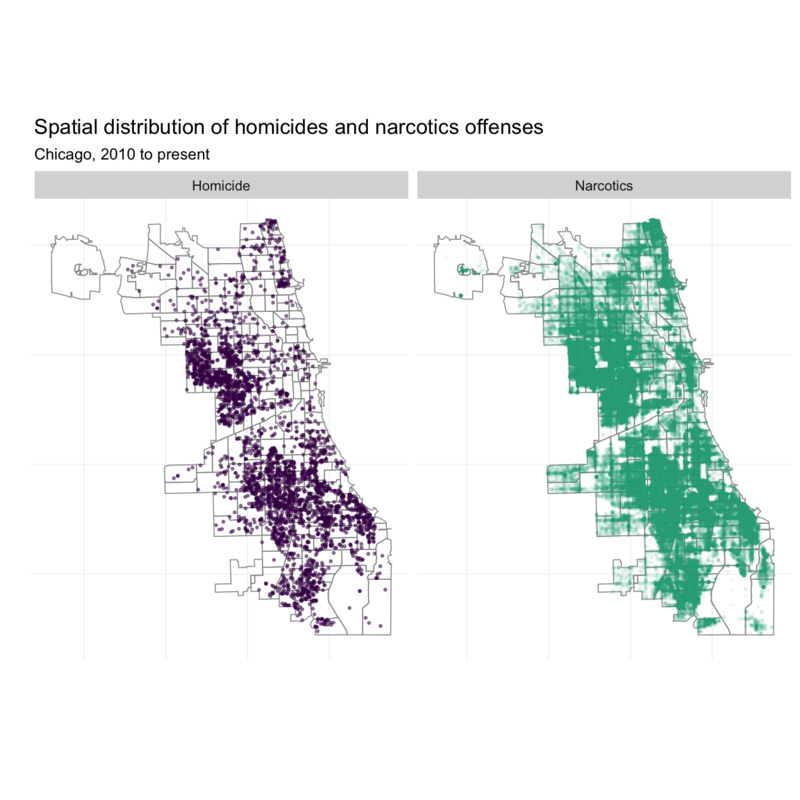 We can now use this union to keep the crimes that fall within Chicago’s city limits.12 In particular, we can use the over() function from the sp package to determine which points are over which polygons.13 Thus, you can also use the over() function to map points to polygons or to grab the value of some variable related to a polygon for each point. Our use is much more simple: if the point is not over a polygon, then we get an NA. This task is sometimes referred to as points in polygons. Now we will use test_points to drop observations outside of Chicago’s limits. Finally, let’s plot the crime points again to see if they now fit inside of the city. But what if we want to do all of this in ggplot2? As we discussed above, ggplot2 doesn’t really want spatial data objects—it just wants data frames (or similar objects). 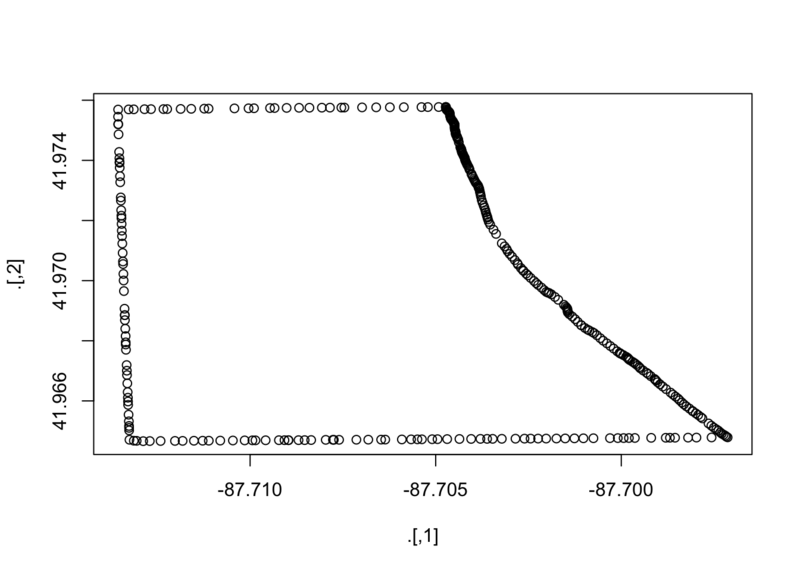 Therefore, to plot the spatial points data frame in ggplot2, we want to convert it back to a standard data frame. Because it may be hand to preserve the spatial object, let’s copy the current crime_df, renaming it to crime_spdf and then convert crime_df to a tbl_df. Alright, we are now ready to plot the police beat polygons with the crime data. Let’s make a map for each class of crime. I’ll add a factor variable for type of crime. I’ll also add year. What if we want to incorporate time into this picture? We can add another dimension to the fact_grid(). I’m also going to look only at 2010, 2013, and 2016 to keep things from getting too crazy. Nice. 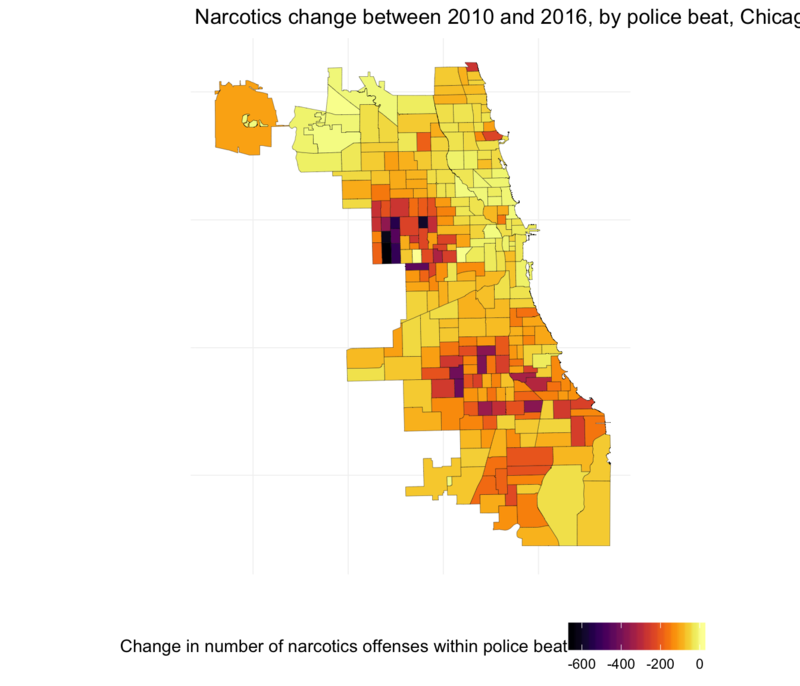 These maps are pretty interesting—you can see Chicago’s highly publicized homicide explosion in 2016, but you can also see a (non-publicized) large drop in the narcotics busts in 2016. What if want to count the number of incidents within a beat? You could use the over() function from the sp package, but the poly.counts() function in the GISTools package is a bit easier. You feed the function a dataset of points and a dataset of polygons, and poly.counts() counts the points within each polygon. which returns a list (the same length as the number of polygons) of integers that count the number of points within each polygon. But what if we want counts by year? Let’s also add a year feature to the spatial points data frame. Now let’s count the points in each polygon (beat) by year and by type of crime. Finally, we will (1) bind these lists of datasets together, and (2) join these datasets onto the data stored in the police beats shapefile (in the data slot). Finally, we can join these data in hom_df and narc_df to the data slot in our shapefile. We will add the row names to the shapefile’s data so that we can join the dataset with narc_df and hom_df. We will then update beats_df using tidy(). Finally, to join the new variables, we will use left_join() from dplyr. It’s a great function. And now, we can plot our shapefile, coloring the police beats by the number of homicides in 2016. We will update beats_df. Let’s also plot the within-beat change between 2010 and 2016. Finally, let’s make the same plots for narcotics. 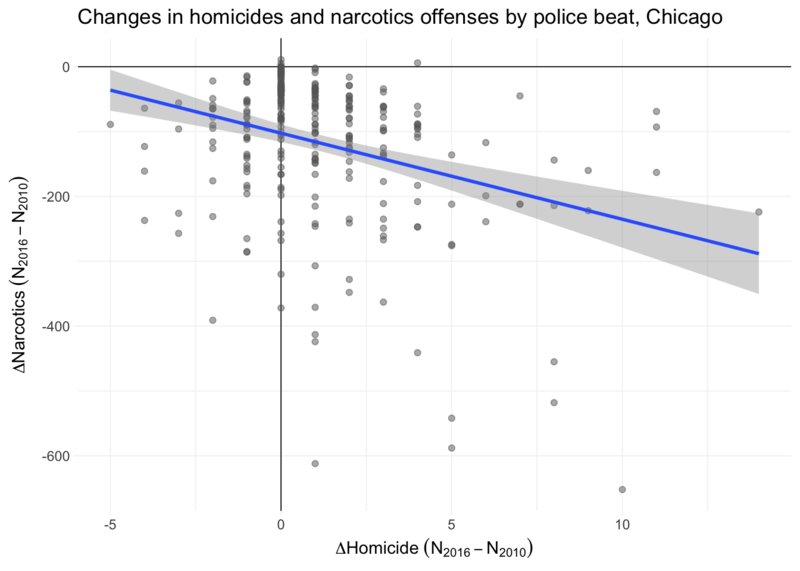 Let’s quickly compare the change in homicides and the change in narcotics. Let’s return to the proj4string slot for a moment. This slot contains the projection (coordinate reference system or CRS) used in creating the shapefile. Different projections yield different sets of coordinates. Thus, if your projects entails multiple datasets—as most do—then you need to make sure that you are using a consistent projection across all of your datasets/files. If you do not, then (0, 0) in one of your datasets may actually be (180, 180) in another of your datasets—nothing will line up (or it will erroneously line up). Be careful here. For information on how to change projections, see the help files ?raster::crs, ?rgdal::spTransform, the proj4 package, and/or the proj.4 website). If you are interested in learing more about spatial data, check out Sol Hsiang’s course, Public Policy 290. 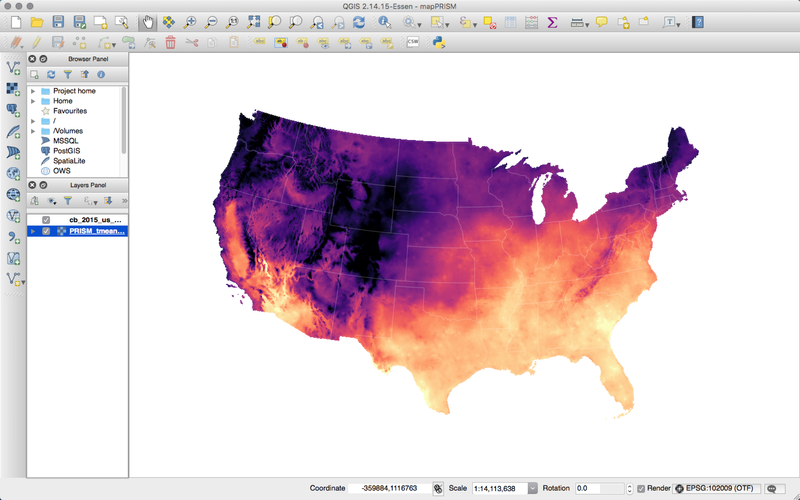 Here are a few more resources for utilizing spatial data in R.
I’m happy to chat more about QGIS, but here’s a quick teaser: Temperature and QGIS. The browser extension unpaywall helps you find papers that are behind a paywall. It doesn’t work all the time, but it works frequently, and I imagine/hope it will continue to get better.